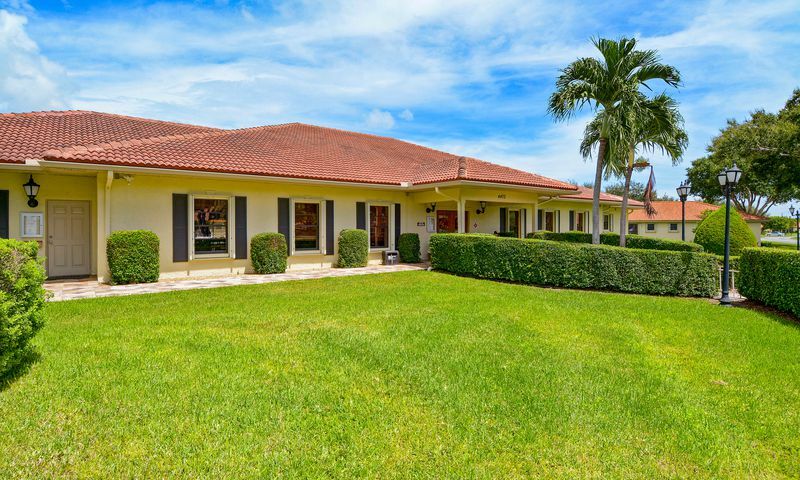 Bent Tree Villas West is a 55+ community located in sunny Boynton Beach, Florida. Active adults of the community enjoy great amenities and a relaxing lifestyle. Homebuyers can choose from attached villas on a resale-only basis. These homes offer low-maintenance exteriors so homeowners can enjoy the excellent beach town culture of the Palm Beach County area. The clubhouse in Bent Tree Villas West is the focal point of the community. Here residents can gather in the multi-purpose room for any one of the clubs offered in the community. They can play a game of billiards or relax with a book from the library. Those looking to stay in shape will enjoy the fitness room with cardiovascular and weight training equipment. There is a ballroom with a stage and catering kitchen that hosts community parties and association meetings. The outdoor pool and spacious patio offers a great place to relax or take a swim during the hotter summer months. The walking and biking trails that wind through the neighborhood provide a great way to stay active and enjoy this beautiful scenic community. Built by Drexel between 1978 and 1983, Bent Tree Villas West offers great attached villas available on a resale-only basis. The single-level duplex homes offer great low-maintenance living with a functional design. Homes in the community offer two bedrooms, two bathrooms, and an attached one-car garage. Homeowners love the open floor plans and screened-in lanais perfect for reading the morning paper. Residents of Bent Tree Villas West live an active and low-maintenance lifestyle. An annual homeowners' association fee covers basic cable, water, general maintenance of the common areas and amenities as well as lawn care of all homes in the community. This allows residents to enjoy all the great amenities in the community. Clubs and activities are planned by the clubhouse manager such as knitters club, book club, and holiday parties. Whether you want to stay socially or physically active there is something for everyone at Bent Tree Villas West. Situated in Boynton Beach, Florida, Bent Tree Villas West is surrounded by beautiful palm trees and a myriad of shopping and dining options. With a close proximity to I-95 travel to other parts of Florida is a breeze. Residents often take day trips to Fort Lauderdale, or just a little farther south to Miami, which are both under an hour's drive away. Golfers love the area for the numerous private and public courses available for all levels of play. Active adults from across the country love Bent Tree Villas West in Palm Beach County, FL. There are plenty of activities available in Bent Tree Villas West. Here is a sample of some of the clubs, activities and classes offered here. The single-level villas are duplex homes with low-maintenance exteriors. Each home in the community offers at least two bedrooms, two bathrooms, and an attached one-car garage. Homeowners love the open floor plans and screened-in lanais perfect for reading the morning paper. 55places.com is not affiliated with the developer(s) or homeowners association of Bent Tree Villas West. The information you submit is distributed to a 55places.com Partner Agent, who is a licensed real estate agent. The information regarding Bent Tree Villas West has not been verified or approved by the developer or homeowners association. Please verify all information prior to purchasing. 55places.com is not responsible for any errors regarding the information displayed on this website.